Many of the top names in pickup and delivery rely on Freightliner Custom Chassis to provide the performance and safety they need. In fact, we are the overwhelming market leader in diesel Walk-in Vans. Our valuable customer relationships are built on the assurance of industry-leading support and the best in innovation, all driven by the heritage and backing of the Daimler group. 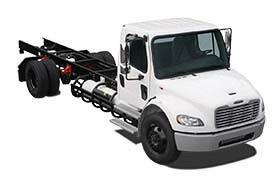 Freightliner Custom Chassis has been offering innovative alternative-fuel chassis for more than a decade. 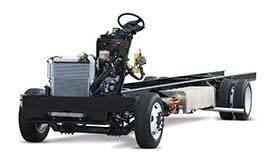 In fact, we were the first to market hybrid-electric chassis for the commercial vehicle market. In 2008, we introduced ecoFRED™, the motorhome industry’s first-ever hybrid-electric chassis, and the MB-HEV hybrid-electric commercial bus chassis. These two alternative-fuel chassis were introduced in response to a growing customer demand for alternative-fuel power that provides the same excellent performance and durability as FCCC’s premium diesel-powered chassis. In March 2009, we introduced a robust alternative-fuel chassis – the hydraulic hybrid, built on the MT-55 walk-in van chassis. We also began manufacturing compressed natural gas (CNG) commercial vehicle chassis and hybrid-electric vehicle (HEV) chassis for the walk-in van market segment. These alternative-fuel vehicles have proven to have significant fuel savings benefits. In 2014, the propane-autogas S2G chassis rolled off the line – the first ever factory-installed propane autogas engine and fuel system available for the medium-duty truck market. But we won’t stop there. Keep an eye out for more green products to come as we continue to innovate and build the best chassis in the industry. 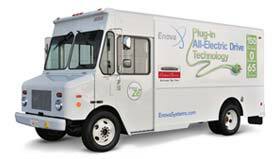 As we continue to explore new technologies and fuel options for your fleet, FCCC remains your single-source solution - no matter the power or application. Freightliner Custom Chassis is the only chassis builder to offer around-the-clock toll-free support directly from the manufacturer. Designed for unsurpassed peace of mind, 24/7 Direct gives you access to trained Freightliner personnel with an average of 19 years’ experience. If for some reason your phone drops the call, or you hang up, a technician will call you back by the end of the day. In many cases, if you’re willing to try a few things, our technicians can get you back on the road. If not, they’ll send out a technician who can. From general support to technical inquiries or breakdown assistance, our friendly phone support team is ready for anything – and can even arrange for roadside assistance, should it be necessary. Simply call 1-800-FTL-HELP. FCCC also offers the largest, most comprehensive service network in the industry, with 450+ Freightliner-branded service locations throughout North America. To locate a service center, click here. 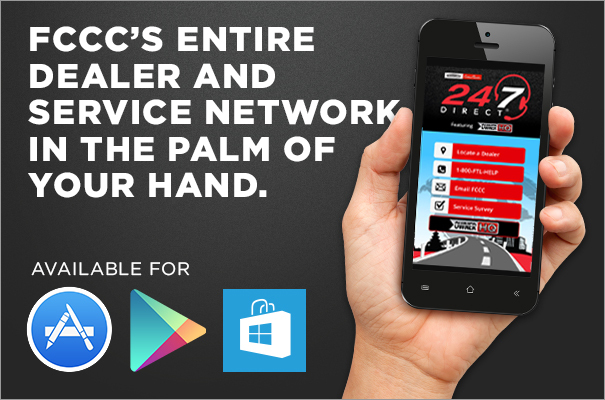 For easier access to the breadth of 24/7 resources, we also offer a 24/7 Direct app for iPhone, Android and Windows devices. The reimagined app featuring OwnerHQ helps you locate service dealers, provide feedback on service experiences, store and share maintenance logs, and access service checklists, owner and maintenance manuals, dash light descriptions, FAQs and more. And of course, our factory-direct phone support is always just a click away. Established in 1995 and trusted by some of the most respected names in the RV, walk-in van, commercial bus and school bus industries, Freightliner Custom Chassis Corporation (FCCC) is a leading manufacturer of premium vehicle chassis. 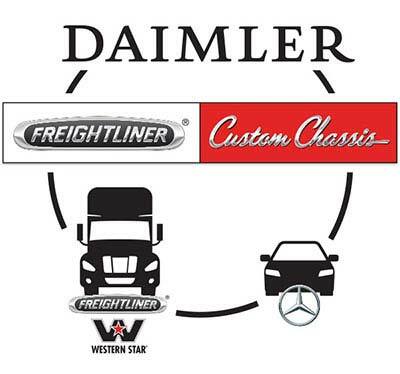 As part of the Daimler family, Freightliner Custom Chassis shares the heritage and engineering excellence of Freightliner and Mercedes-Benz – leveraging expertise in heavy-duty durability and precision performance to infuse each of our chassis with the best of all worlds. Located in Gaffney, South Carolina, FCCC employs more than 650 employees in our manufacturing, customer support and retail facilities. As the world’s largest manufacturer of diesel walk-in van chassis, nearly two-thirds of all diesel walk-in van chassis sold today are made by FCCC. We also hold more than half the market in Type A diesel motor home chassis and more than a quarter of the market in conventional school bus chassis. At FCCC, we recognize that our goal of building market-leading chassis cannot be realized without a thorough understanding of – and response to – our customers’ needs. We deliver superior performance, safety, reliability and customer support based on a wealth of in-depth knowledge and resources, because as we always tell our customers, we’re proud to say we’re Driven by You. If you have any comments, questions or suggestions about our products, options, website, dealers or anything else, please let us know. It's the best way to make sure our service meets your expectations.